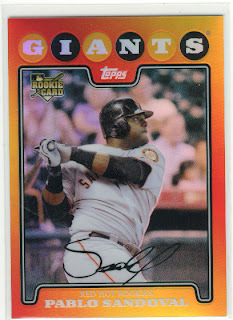 A Cardboard Problem: Red Hot Rookie Redemption In Hand! After over a year of waiting, there were two Tri-Star fulfillment envelopes in my mailbox today. 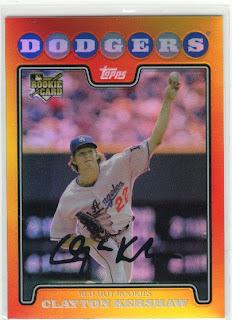 Red Hot Rookies number #11 Clayton Kershaw, and #14 Pablo Sandoval have arrived and are pretty sweet looking. I scanned both the front and back of each card to show everyone what they finally ended up looking like after all this waiting and anticipation. Simply stated, they are really nice Topps Chrome refractors. I like them because they are un-like all the other cards out there. I'm going to hold onto them for a bit and decide if they are worth trading, at least I think that's what I am going to do. What sets these cards apart from other rookies is that they are alot harder to find, and they are different than your average rookie card. Probably would have been a cool idea to continue these from year to year, but with the length of time it took them to deliver on them I can see why they are not doing that. I think Kershaw is going to be a great pitcher, and I have also heard great things about Sandoval from fellow bloggers as well as from reading stuff. I don't think I did terrible on these two guys. Let me know what you think of them, or if you got yours today who you got as well as what you think of 'em. 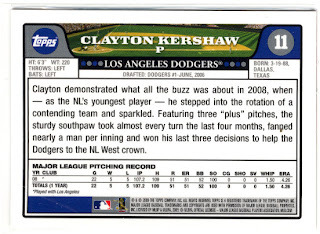 Kershaw's a future Hall of Famer. OK, that's my irrational fan side talking. But he's got huge potential. I'm glad to see that you got yours. I was getting a bit worried about mine. 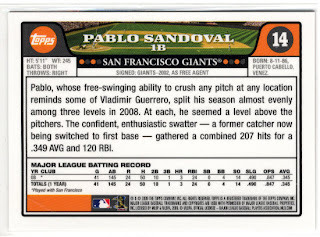 Topps said that my card shipped at the beginning of March, but it hasn't shown up here yet. I also noticed that they decided to leave off their silly Hotwheels Red Hot Rookie logo.